Being the Wild Heathens that we are, we were holding out for some timely and friendly earth mojo before we officially began our gardens. Trev was still waking up, and Maddie was thinking 'plant beans' (watermelon beans, to be more precise) from an idea in our seed book yesterday. 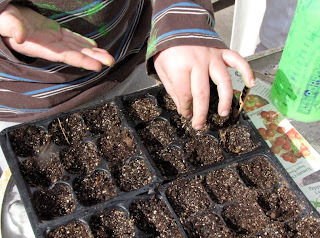 You plant several in eggshells, and then can easily check on the progress every few days, hopefully with a bean plant or two left in tact at the end of your investigations. 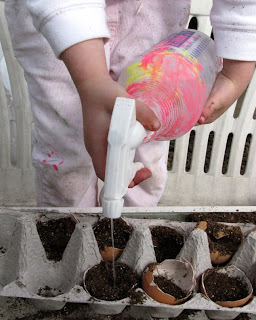 So after designing/painting spray bottles for keeping our seeds moist (and after breakfast) we got right to it. And then we began our flats. 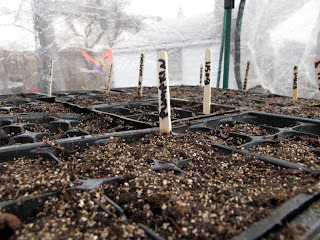 We started our romas, sweet cherries (tomatoes), beef steaks, watermelon beans, red onions, habeneros, sweet peppers, lots of italian large leaf sweet basil (one for the happiness of every tomato plant), giant pumpkins and jack o-lantern pumpkins. Every magical garden needs a few pupmpkins, you know. And we got the sugar snaps into their pre-soak water. Mama did some planting while the babes played in the backyard. "Mom... have you noticed that Daddy gets home so much earlier, now?" "Actually, honey, Daddy doesn't get home any earlier, it just seems that way because the days are getting longer." "Mmhmm, it starts getting dark after six now, instead of at five. It's getting to be spring!!" "So let me get this straight.... the days are longer in the springtime?" "That's what makes them seasons. The days are shorter in the winter, and longest in the summer..."
On and on it for about ten minutes or so, including things that are related to winter and spring. It's funny... of course we've discussed these sorts of things before (uh, like at winter solstice, the equinoxes, Ostara, etc, not to mention have read books about the seasons).... but it's funny how it doesn't really matter to us until it really Matters. :) Like when Daddy starts coming home early enough to play in the sunlight. The weather promised rain, and indeed we had just a few drops of it around noon, but we still wanted to spend our day outdoors. Eric had the truck (and our umbrella in the truck), but we have perfectly fine feet, so it was decided that we would walk up to the store to get ourselves a couple of umbrellas, and head to the library, lunch, and then on to the park. We came back home with our new umbrellas, and with the wagon loaded with our returning library books and magnifying glasses we headed off for our adventures. Spring bugs and library books.... here we come! Madd had a little trouble in the library, and as it turned out we had to come back home to get her some dry britches. 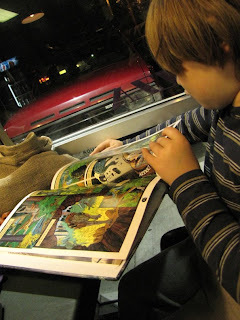 The then tired babes rested for a bit, and it was decided that we'd wait for Daddy to come home, and invite him to come to our favorite pizza place with us. 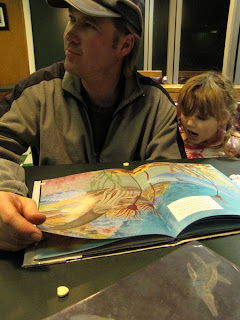 We grabbed a few library books and read about early earth history while we waited for our pie to cook. One last stop to the video store for a couple of movies and to home! to home! 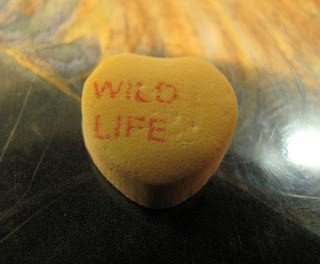 Eric slipped his wife this heart across the table with a grin. 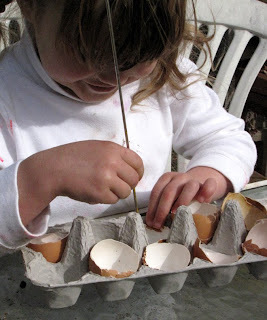 I love the eggshells, it doesn't get any more natural than that. 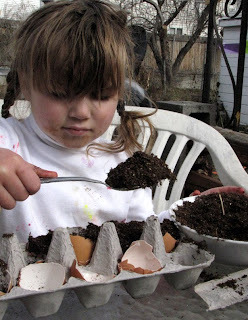 I never thought of egg shells!! hey, I'm wondering, what exactly goes into fairy and butterfly gardens?! 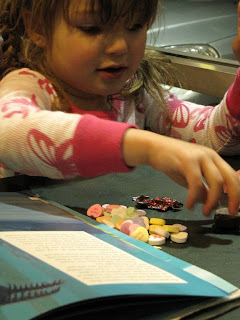 Did you put them together yourself or find the info in a book? I'd love to know! We raise painted lady butterflies every summer and it would be nice to have a garden for them!-They always hightail it over to the NEIGHBORS flower garden!!!! 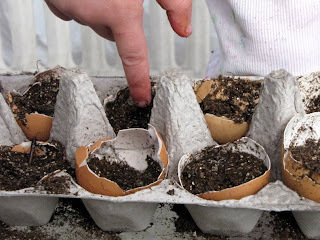 Oh, I love the eggshell idea! I've GOT to use that one! But, did we miss the only Magical Planting Date? Or do you think tomorrow will still be good? 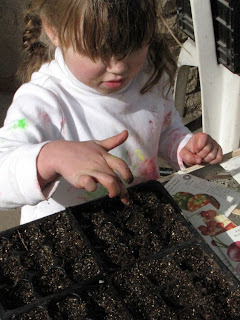 My heirloom seeds arrived yesterday, but we're out all day today! Late Saturday night thru Monday evening is the next moist and productive time. A lovely day indeed! Thanks for the eggshell idea. Your garden is going to be bountiful! Oh, your garden is going to be magical.